The Vaccines' Come of Age should come with a warning sticker. There are some seriously addictive ohrwurms on U.K. band's second album, that are going to be pinging around inside your noggin for at least a week. Be prepared to be driven crazy. A delicious blend of break-neck Ramones-paced rhythms, surf choruses and sinfully hooky melodies, this is pop music that makes no apologies for being pop music. But make no mistake, despite the mid-century rock n roll esthetics, there are no California Girls on Come of Age. Or if there are, they are being dumped by self-absorbed twenty-somethings. Okay, the lyrics on Come of Age are not exactly high-brow, but they do contain a darkness that clashes beautifully with those bright upbeat melodies. It's an appealing juxtaposition that gives a bit of a nod to the Smiths. Deeper in the album, some of the melodic brightness is replaced with deeper, darker, more jangly guitars. But the hooks are just as catchy and you'll still want to handclap along. Over the course of their short career, the Vaccines have received tonnes of kudos (and award hardware) for their infectious sound. Naturally they've received just as much criticism for the exact same reason. On Come of Age, the Vaccines deliver top-notch sing-along road trip and party music. And there's not a thing wrong with that. 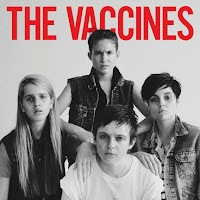 Great review Barb - I haven't heard The Vaccines yet - sounds like great music to bop along to in the car on the way to a night out on the town. Makes me want to roll down the window and scream "gabba gabba hey". Thanks, Matthew! I think you have hit upon the perfect fit for this album. All you need is your leather jacket and your Joey Ramone cut and you'll be set for Friday night. Great review! I've been ignoring The Vaccines for no good reason ever since their first album came out, but now that they have the Zombie seal of approval, I must go check out some of their tunes. And you're absolutely right - fun, seemingly frivolous music is never inherently inferior to serious-business music. I am pretty sure that you'll be happy with that decision, BAP! With indie music becoming increasingly introspective, we need a jolt of upbeat every now and then.